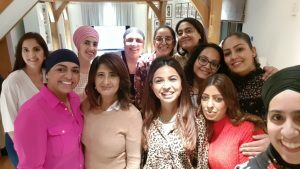 As I made my way through the Oxfordshire countryside, London-bound for a workshop, I thought about the contribution I would make in this group of successful business women and artists. I concentrated on recalling career and personal successes I could usefully share. I prepared my ‘about me’ intro, finished off the pre-workshop exercises and thought about my ‘elevator pitch’ to help answer this. It felt good to be on my way. Excitement rose as I would finally meet a remarkable woman I connected with some years ago on Twitter (my favourite kind of social media!). This overrode the nervousness of walking into a room full of brand new faces, as meeting Rupinder, the founder of AWMB, had long been on my inspiration wish list. (AWMB are also active on instagram and I can’t recommend enough that you follow). I set up that Twitter account to connect with those not in my daily sphere of experience. At the time I was going through massive bereavement, redundancy and the ensuing financial challenges when between jobs. I needed an out.. to find my voice and direction again so I tweeted on issues I was interested in. It proved fruitful as I connected with some genuinely sincere and faith-affirmingly authentic types. I’d found a new tribe, support groups for bullying, bereavement and so much more. Now more than ever it’s important to connect, speak up and take action on issues that affect us as minority women. Finding my voice online, in part, re-instilled the courage in me to attend this workshop. Had I never been made redundant I may never have questioned the state and happiness of my life, the deterioration in my physical and mental health. Looking back things falling apart was an opportunity for me to reconfigure and re-chart my course. I didn’t have the mindset then to appreciate those circumstances. Then, it was more a question of personal and financial survival. I relate the above as a peek into what personally led me to attend this workshop. I had no idea how life-affirming it would be. I had long been on this mission to improve every aspect of my life and had begun to listen to my core instincts again. I followed my heart and signed up. The old me couldn’t have walked into a room of strangers. Even if nothing came from this just attending was a major win for me. The minute I pulled up the drive in this beautiful remote location I KNEW it was going to be a pivotal day. 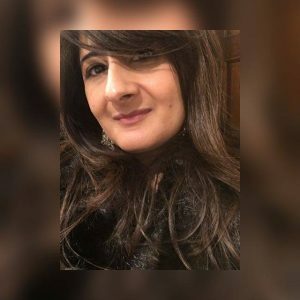 As soon as Rupinder, our incredibly warm hostess and founder of AWMB, opened the door a rush of welcoming peaceful energy enveloped me and ushered me in. We closed the door on a dreary January day behind us to join the others already arrived. We all instantly connected over freshly brewed hot coffee and cakes. I felt immediately at home and delighted to be there. There could not have been a more perfect setting and meeting place for us. This was no accident either as I would later learn from Rupinder when she generously shared the story of building ‘Rehmat’, how there was a conscious decision in choosing the right materials to promote that beautiful soulful vibe you feel the second you enter. The chime of a beautiful bell asked us to be seated. Fresh hot tea in hand (and gluten free goodies Rupinder had so thoughtfully provided) I found my spot on the giant sofa. Making ourselves comfortable, we started with a cleansing meditation. Admittedly I sneaked a peek with one eye open for a few seconds at the wonderful ladies I was sharing this room with. Their energy commitment and deep concentration made my heart leap. I knew I was in the right place. It was going to be a very special day. The calm personal opening words from Rupinder reiterated I was in the right place. My initial thoughts were “highly ambitious driven women with a collaborative mindset would share ideas and goals with a view to learning new tools for continued progress”. We did that, yes, but so much more, in ways I never expected and with a degree of authenticity and honesty that was liberating. I had expected a more corporate flavour as that’s what I was used to. This far exceeded that. Setting clinical goals without addressing the personal daily issues we face only deals with a small part of our evolution. To achieve our goals it’s not just our mindset we need to hone. On a heart and soul level we need to connect with ourselves. Are we working on the right goals for us? We opened up on all levels as we introduced ourselves. It was clear my little opener although authentic was not appropriate to the deeply real vibe of the room. I’d learned about heartset, healthset and soulset in addition to mindset (Robin Sharma) over the last few years but had rarely seen it in action as I did then. It’s clear now that focusing on your mindset alone is not enough. Until we don’t address all aspects of ourselves the success we achieve may not fulfil us as we wonder what STILL plagues us even though we are excelling? How can we set a forward course if we’re not aware of our subconscious drivers? How can we know if the goals we have set are true and healthy if we don’t know the emotions driving them? How can we play our A game if we are sabotaging ourselves by not addressing these deep issues? As we went round the room I was in awe listening to my companions share their career and personal stories. How truly uplifting to hear their successes across the professional spectrum from engineering to singing. What took it to a different superlative level was the accompanying struggles and self doubts that were also shared alongside the determination to step out of our comfort zones, to achieve success in uncharted territory, even in the face of family opposition. To succeed for ourselves in spite of childhood traumas or lack of support. To continue building businesses even when others tell us we should be at home with our children. To know how to be our own best friend and get on with breathing life into deeply held dreams. The tissue box had to passed round more than once as we got to know some of the painful backdrop behind the hard-won successes. Pain that was turned into life lessons for growth by the way. The AWMB ethos communicated at the outset provided a safe confidential environment for us share our stories, our goals and our stumbling blocks. In turn we also shared many strategies, information resources and books as we worked through ‘killer clarity questions’ regarding our life and business direction. The personal tools provided can be revisited again and again to create a firm foundation for true success in all aspects of our life. What personal price have we paid to achieve certain professional goals to date? How are we limiting ourselves subconsciously supporting cultural norms that have no positive value in our lives? How can we move forward investing not only in our professional lives but in realising the fundamental importance of investing in ourselves, our health, our creativity, our joy and happiness? We shared the most wonderful lunch with mouthwatering contributions from Lorna Gangotra, Chintal’s Kitchen and tasted the ultimate Ayurvedic energy snack from dadimas, Panjiri. Fair to say brown peeps have had the high protein energy ball market nailed for millennia. We need to put that out there a little louder and prouder! Our guest speaker was the founder of dadimas, Anneeka. Her absolute honesty in sharing her business and personal journey was a real eye-opener in the battles we face not just from others but also from our own self doubt in the face of so-called rational opposition. Her inner drive and self belief together with having the right supportive people around underlined the need to keep going. Had she given up and returned to her former (successful) career she would not be living true to her goals and passions. A lesson for us all. Self-belief and perseverance are everything. 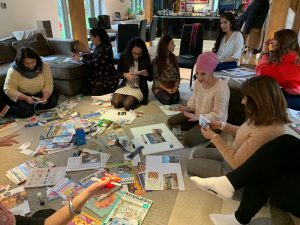 As softly scented candles burned we created vision boards reflecting the goals and values we had been sharing. There’s something quite edifying about seeing your thoughts and dreams on a board in pictorial form so different from listing goals and resolutions on a cold dreary January day before you head back into the daily grind. In that one day we addressed many of the above questions paving the way for continued support in our respective ventures. It’s not overstating the fact to say we found a new radiating tribe that shared each other’s spiritual and professional values. From that one workshop many new activities are due to follow such was the connection and support. There’s already been a comedy night out to see Noreen Khan. Professional cooking lessons from BBC Winner of The Big Family Cooking Showdown, Lorna Gangotra follow next month. Anni is running cooking lessons in April for our younger ones. Rupinder has got us into Parkruns with many committing to joining. The parents in our group have been implementing many of the positive exercises with their children laying firm future foundations for real success. 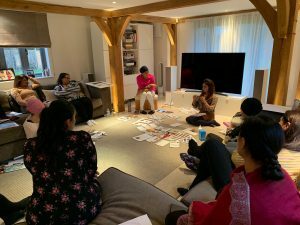 Rupinder and Janina (who shared details of her wonderful initiative The Kitaab Klub connecting people through the love of books) put together such a wonderful group. They created a perfect vibe and atmosphere for us to connect, spark new relationships and form new interests. In what has been a quite a solo journey so far I now have a like-minded tribe to work with and enjoy together the next steps of our inner engineering. The word ‘workshop’ does not sum up our experience that day. It was exponentially so much more than that. Thank you AWMB. Confessions of an AWMB Intern: The Catty Competition?